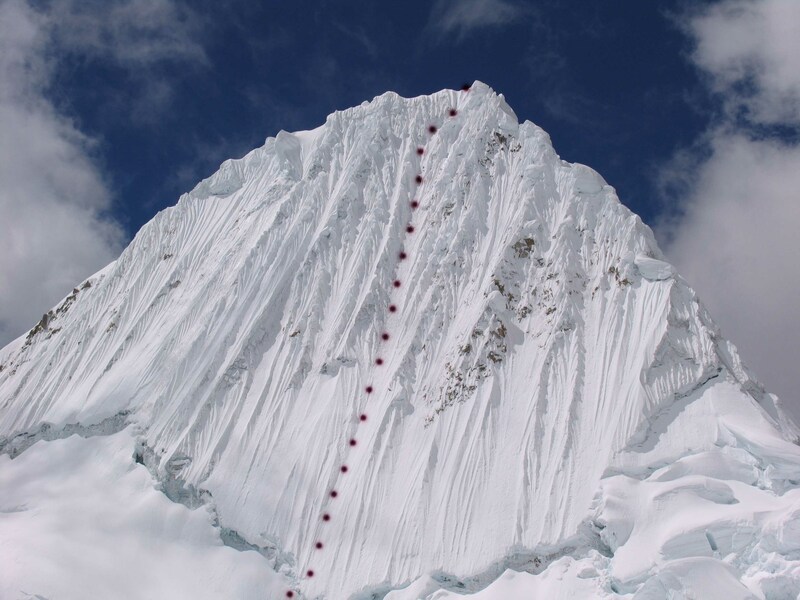 Alpamayo is not a 6000 m peak or almost not or not anymore but it belongs to the most famous mountains of the Cordillera Blanca thank to its regularly half-circle shaped south-west face streaked with snow “canaletas”, a 2700 m bigger brother of the rocky but geometrically similar Swiss Piz Radönt. 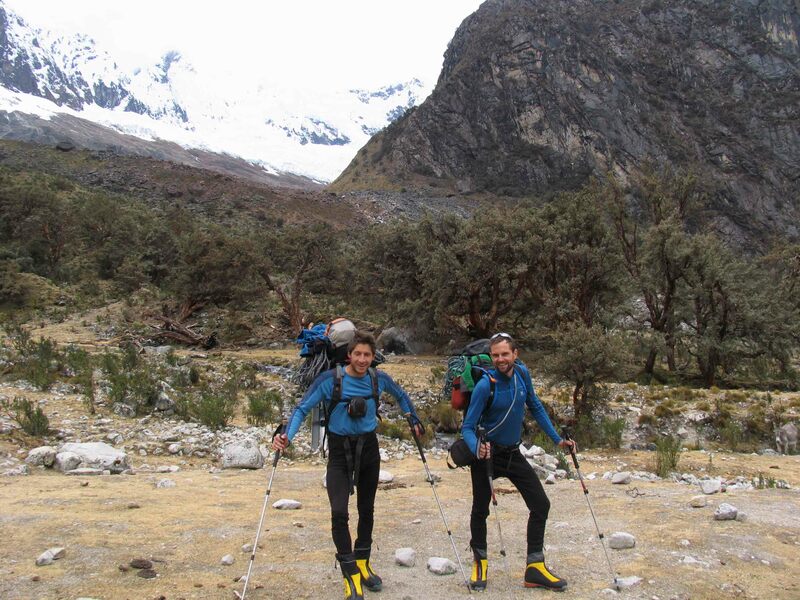 Climbing Alpamayo was a long-term idea/project/dream of Marius and we had to undertake it with him. 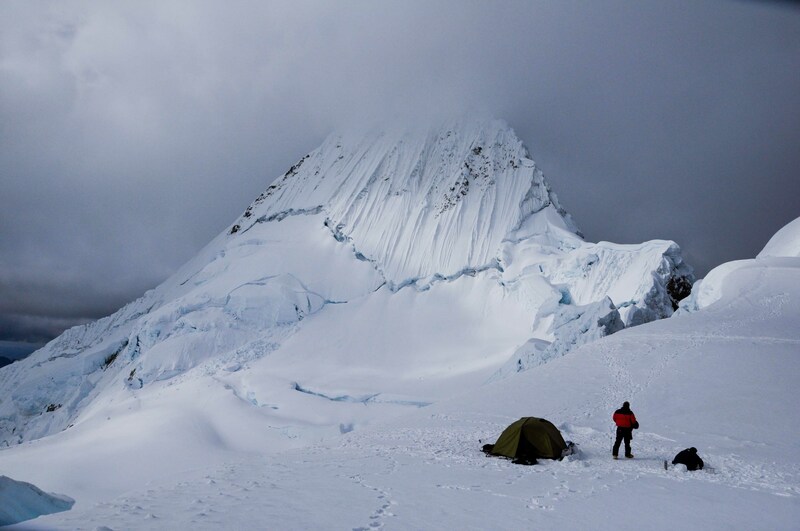 Alpamayo is quite remote from the Huaraz valley and its ascent normally requires 6 days: 3 days of approach, 1 day to the summit and 2 days returning. Indeed 6 days went by until we were back in Huaraz. On day 1, we had a 3 hours drive to Cashapampa at 3000 m, changing of “collectivo” in Caraz. Cashapampa is one rural village on the plateau dominating the main valley and is at the entrance of the Santa Cruz valley and at the start of the eponymous trek. We hired an “arriero” and two “mulas”. The local people are well organized: (1) they leave only one “arriero” at the time at the start of the trek (minimize the offer) and they have agreed on prices so that bargaining is difficult for the visitor. Once the duty “arriero” is hired, he is replaced by the next one. On the same day, we walked with light backpacks and our three new companions until Llamacorral at 3800 m following the narrow and steep-sided valley coming across lonely cows and horses. We firmly intended to have a swim in the river next to the camp but the shade took hold of the place at the same time like we did and since at these latitudes it is as warm in the sun as it is cold in the shade we put the refreshment off until later. We cooked a fine soup from a pack of vegetable and cilantro bought at the Huaraz market the day before. As it is the rule, we provided our “arriero” with food and shelter. On day 2, we woke up as our “arriero” was running and waving and shouting on steep slopes far up above the camp rounding up the “mulas”. We counted three lakes, one howling horse and one debris-flow devastated river bed until we arrived at the base camp at 4300 m at midday. At the base camp we ate the “paltas” offered by Andy the day of our departure, took leave of our “arriero”, slipped into our skin-tight hoses and left for the moraine camp at 4500 m (note that camps have always the same names: base, moraine, high, … which is not related to the effect of air rarefaction on the moutaineer brains). On day 4, we woke up at 1 am, had breakfast in the tent with the hot water kept in thermos bottles next to our heads and went back to bed till 3 am because of the bad weather. At 3 am we left our warm sleeping bags and made our way down the pass and up to the bergschrund. Our legs were sinking in the new snow up to the knees and the visibility was so poor that we turned back. The rest of the day, we slept, melted snow, learnt how to play “skat” with Marius and damned the zips of our rental tent. Around 1 pm, four guys showed up along with the sun and set up camp at the foot of the pass. On day 5, we woke up at 0 am, wind booming in the night but stars shining. 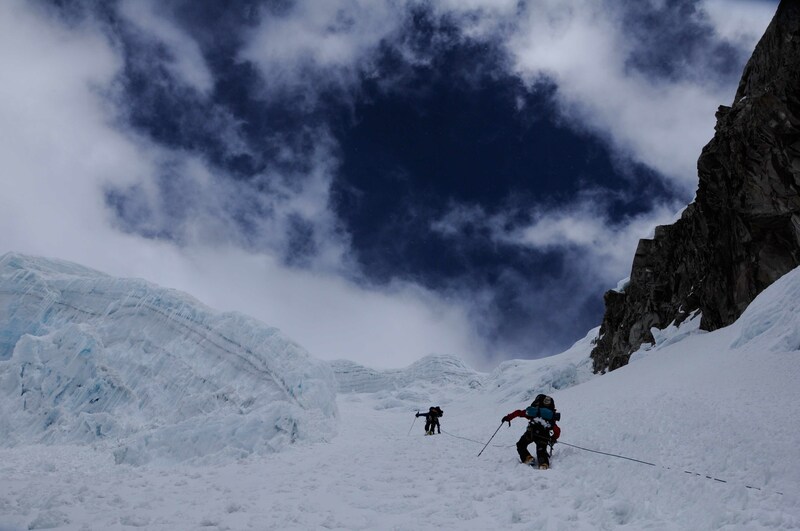 We knew that Peruan guides leave at 1 am, regardless of the climb and we wanted to be in front of the two other teams to avoid the risk of ice splinters falling from teams above us. New snow had settled down in the afternoon of day 4 and we reached the bergschrund without difficulty, surmounted it twice!! because of its contorted form and entered the straight, 60 degrees steep, 400 m long “canaleta” that the “French direct” route follows. Stephan led, securing the first three snow pitches with “estacas”and the last four ice pitches with ice screws. The cold was going right through all our layers: fleece, down and gore-tex whereas the wind was giving no break to our hooded faces. Of the four guys who turned out to be a Swiss client, a Peruan guide, a cook and a carrier, only the two first ones started the climb half an hour after us and caught us up in the last third of the route when daylight was progressively pouring down the top slopes. At 9 am we were on the summit, enjoying thousand meters of void below us and frozen cereal bars in our mouths. At dusk we were at the base camp falling asleep in a dreamless night. On day 6, we walked the 25 km distance and the 1300 m negative height difference carrying backpacks too heavy to make it an enjoyable experience. But the bath in the river a few hundred meters above Cashapampa and the eucalyptus flagrances in the afternoon heat relieved momentarily the sore backs and the tired legs. Our next destination, the beautiful Artesonraju!